With the NX 6500 Zebra makes entering the world of enterprise networks easier for you. The controller provides the base for the network and with it you manage up to 264 separate 802.11a/b/g/n WiNG 5 access points, which are capable of offering up to 4,000 users a reliable and secure WLAN connection at the same time. The controller combines the functions of a router, firewall, VPN, DHCP and DNS server. Thus, you save on the number of devices needed as well as the costs for operating the networks, plus you significantly simplify administration. The controller receives additional functions via the installation of an expansion card. Available to you are WAN, analog telephony and a combination of PSTN and an analog telephony module. This way, extra functions are bunched into the device, which at the same time means lowered infrastructure operating costs. 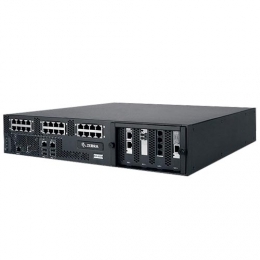 The NX 6524 contains two standard integrated 10/100/1000 Mbps LAN ports and 24 additional 10/100/1000 Mbps PoE ports. Thanks to the 2U rack-mount shape factor, you easily mount the NX 6500 into existing server cabinetry.